One of the joys of a Dry Tortugas camping trip is the opportunity for avid birdwatchers to spot new birds they haven't seen before or to re-encounter old friends who are just migrating through. One recent sighting around the camp grounds was the American Kestrel, a colorful and fierce little falcon that can be spotted year-round in the park by those lucky enough or patient enough. Luckily, they are not a shy bird and often can be found near centers of human activity. Sadly, their numbers are slowly declining so bird watchers who would like the continued opportunity for sightings should do their best to aid in conservation efforts. Unlike other birds the American Kestrel can be found in almost every continental U.S. state even during winter, as they retreat southwards only slightly even during the coldest months of the year. This year-round affinity for the continental United States is likely one source of their patriotic name. These energetic birds can often be seen on power or telephone lines and can hunt insects, their favorite meal, both from the ground and from the air. They also feed on small rodents and other birds. Due to their size they often risk becoming a meal themselves, not only from external prey such as snakes but from other, larger, birds as well. Similar in appearance to merlins, though more cautious in their hunting styles, these small falcons are a favorite with many both within the park and in the larger birdwatching community. Like many other species of birds, the female is a more muted color than her male counterpart, who in addition to the standard russet tones that all American Kestrals display, also has slate blue wings and heads. Females also differ from the males in their preference for wide open spaces and warmer weather. In fact, they generally migrate to their winter grounds earlier than the males do. One unusual aspect of the American Kestrel is their method of nesting. Rather than building a nest, they select from existing hollows, holes, and depressions, including artificial manmade nesting boxes. The male will do the initial scouting, but females get final say on where they will nest. These birds are not particularly good housekeepers once settled in, and will defecate against the sides of their nest as well as leave half eaten food lying around. Their habit of hiding leftover food also extends to outside their nest, making them natural hoarders. Younger guests to the park may sympathize with the college dorm level of cleanliness maintained by these otherwise delightful birds. Another way to identify the American Kestrel is by their call. They have a cheerful, sharp tone to their chirps, which are generally in short burst and have a squeaky 'klee' sound to them. They also have a more subdued rusty chitter that they make. 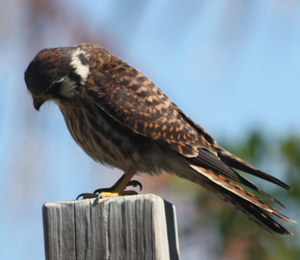 These cries can help observant birdwatchers at the camp grounds spot the kestrel's nest. Whether using their appearance, nests, or calls to find them, this small bird is a pleasant sight for any birdwatcher.